Captain Owen works hard to ensure guests have a great fishing experience, providing most of the necessary fishing equipment, including a license AND A RESTROOM! We suggest anglers bring a large cooler, a few snacks, and plenty of sunscreen; we’ll supply the rest. 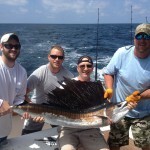 The species we catch range from Flounder inshore to Grouper and Mahi Mahi offshore. 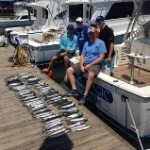 We offer different kinds of fishing including trolling, casting and bottom fishing. Let us guide you in the right direction with our one of a kind ocean charter fishing guide. Fishing should be relaxing, and when it is, it’s a rewarding pastime. At Cape Fear Coastal Charters, we believe a memorable fishing trip begins with a great crew, good friends, and of course, tons of fish. 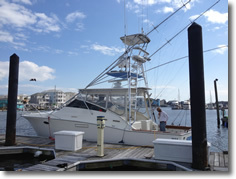 There are plenty of guides up and down the North Carolina Beaches, but our knowledge, experience, and Southern hospitality set us apart from the other inshore and offshore fishing charters. If big fun and bigger fish is what you’re looking for, give us a call, or book online today. We know all the best spots, and we want to let you in on the secret!